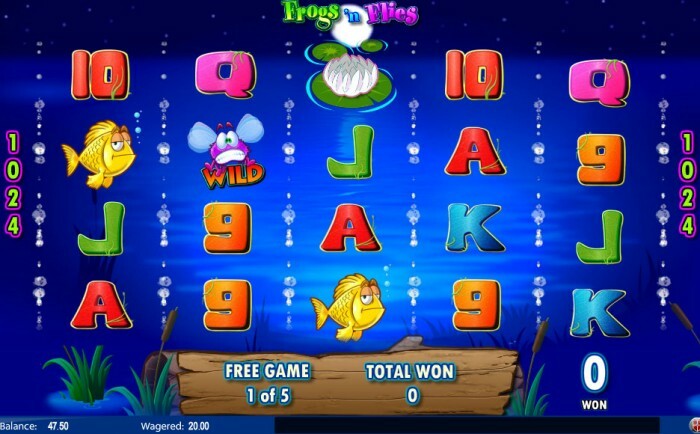 Frogs 'n Flies is a slot that is easy to play. Despite there being four rows instead of three, the slot doesn't have any strange features in it, making the functions of the slot stay the same. This slot uses the nine up until the ace to fill the wheels. Besides these, animations are used in line with the theme of the slot. For example, the wheels can have lilies on them, or even turtles or fish. The wild is easy to recognize during playing. In the normal slot this is a frog, but during the free spins, an extra symbol is added. The name of this slot is based on the scatter. Naturally, the wild cannot replace this; that would be too easy! Frogs ‘n Flies is a slot that will directly grab your attention when you open the slot. It’s a video slot developed by Amaya, and it’s sublime. There aren’t three rows, but four, and you really can’t speak of actual wheels in this slot. The wheels are only separated by bubbles, making it apparent you’re playing underwater. The best part about this slot are the free spins. Here, you can win extra, due to the wild symbols on the wheels. That’s always a bonus! How to play Frogs ‘n Flies? 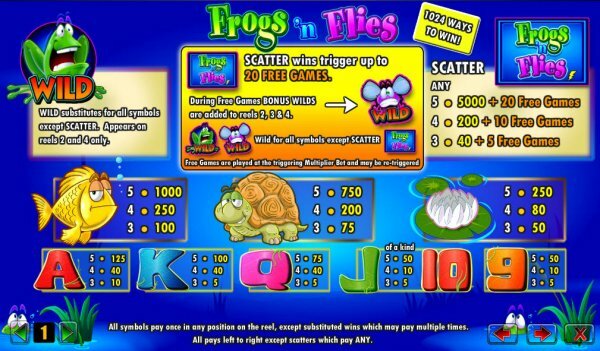 Frogs ‘n Flies is a slot that is easy to play. Despite there being four rows instead of three, the slot doesn’t have any strange features in it, making the functions of the slot stay the same. This slot uses the nine up until the ace to fill the wheels. Besides these, animations are used in line with the theme of the slot. For example, the wheels can have lilies on them, or even turtles or fish. The wild is easy to recognize during playing. In the normal slot this is a frog, but during the free spins, an extra symbol is added. The name of this slot is based on the scatter. Naturally, the wild cannot replace this; that would be too easy! 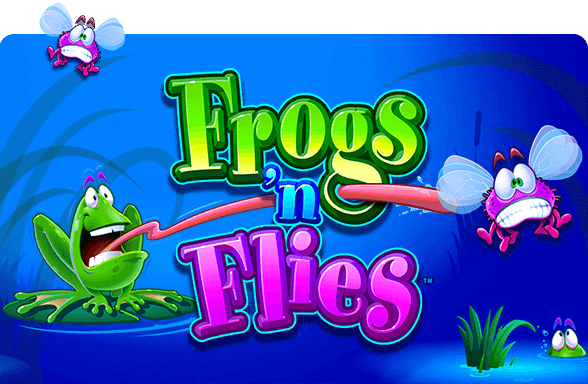 Frogs ‘n Flies features free spins, and in this function, the slot really comes alive. To achieve this, you need the scatter at least three times. Three times the scatter will give you five free spins, four times will earn you 10, and with five times the scatter you’ll receive 20 free spins. During these free spins, the slot adds new symbols to the second, third and fourth wheel. These symbols are flies, and these are the wild symbols. The frog also remains a wild symbol, hence the name of the slot. During the free spins, you’ll have extra chance to win, without even having to bet a euro to spin the wheels. But it gets even better. During the free spins, it’s possible to get the scatter on the wheels thrice or more. When this happens, you get even more free spins, allowing you to play in the free mode even longer! Frogs ‘n Flies doesn’t make use of pay lines during the game. Amaya chose to use “ways to win”, and in this slot here are 1024. This is the normal amount for a slot with five wheels and four rows. Because of these ways to win, it’s easier to keep overview during spinning the wheels. Under in the slot, you can choose the number of coins and the value per coin, and you will also find the auto spin. The autos spin will continue during the free spins. We advise you to turn up the volume of the slot during this game, as it enhances the experience greatly.